There certainly wasn't a shortage of Beatles trading cards at the height of Beatlemania. 1964 Topps Beatles Color trading cards is one of seven sets made by the card maker that year. It's also one of the most insightful. 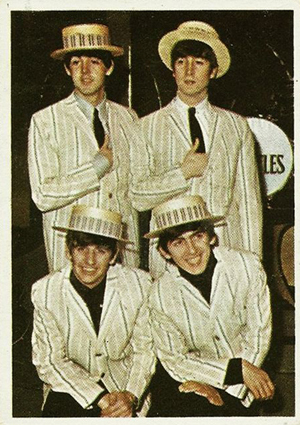 As the name suggests, 1964 Topps Beatles Color features full-color photos. This is a stark contrast from the company's multi-series Beatles Black and White set. Card fronts offer a lively look at the band, with a large color photo framed by a thin white border. Several of the images are very similar to those used in other Topps Beatles sets. Card backs are also a big step up from the plain backs of the Black and White sets. They have an orange background with illustrations of all four of the Beatles running down the side. The top of the card reads, "Beatles Color Cards." Below that is a large box that has a question for one of the band members. Either John, Paul, Ringo or George answer the question. The 1964 Topps Beatles Color checklist has 64 cards. 1964 The Beatles Color Lot Cards # 63 60 56 47 And 7. Topps T. C. G.
64 cards. Checklist notes who is on the front and who is featured on the back. have Beatles cards..where do I go to sell them? have Beatles trading cards. Where and how do I sell them? Teresa Orr � eBay is probably your best bet. If they’re in nice condition (no creases, nice centering, sharp corners), you may want to look into getting them graded by PSA (psadna.com) first. Checking in with a local card store or even antique shop might be a good first step too in helping you determine condition. I have numbers 8, 18, 25, 39, 44, 46, 51, 63 of the Beatles Color Cards. very good condition. Wondering if you were aware of a variant on card #148 from the 3rd series of the B&W cards. Variation concerns the airbrushing of the cleavage of the young lady at the right side of the card. I have several that are not airbrushed but one that has obviously been touched up to hide her exposure. I have 377 beatle trading cards and have no idea where to start researching them. I was wondering WHERE to start. Are there any more valuable then others?